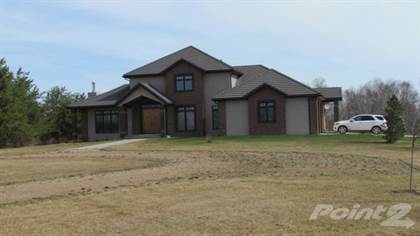 Executive home priced to sell close to Clyde is picture perfect with wrought iron electronic gates that lead to this home.This spectacular custom built home sits on 156 acres of fully fenced beautifully landscaped land with 2 shops and a metal clad barn. A Castle like grand solid wood front door greets you to this high end mansion. Gorgeous limestone tiled floors lead to a chefs dream kitchen with solid walnut cabinets massive granite island for entertaining, sub zero fridge, s/steel gas stove and double oven.The o/sized dining area has patio doors leading to aggregate stone patio with glass railing and fire pit .Bright sunny living room boasts a architectural designed brick wood burning fireplace & french doors leading to the office. Upstairs there is a cool loft area, huge main spa like bathroom with built in make up station. Main floor master suite has luxurious en-suite & vintage clawfoot bathtub and granite counters. An attached infloor heated garage. New well 2013. Priced way below appraised value. Hi, I'd like to find out more information about 59425 RR 240A. Thanks so much!